Founder, Beer Street Journal. Stormtrooper. Harpoon’s 100 Barrel series is what the brewery calls a return to their roots. The 100 Barrel series is exactly as it sounds. Small batch, one of a kind, 100 barrels. Throughout the year, a different Harpoon brewer will create a recipe from start to finish. As a finishing touch, the brewer signs the label. It’s completely their creation. Like a piece of artwork. To date, there have been 31 releases from the 100 Barrel Series. Make way for #32. 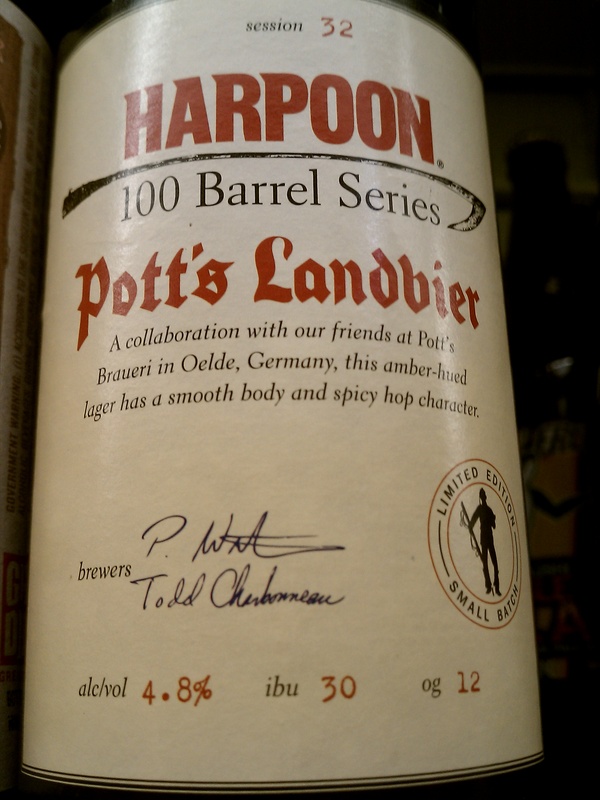 “The origins of this beer go back to 2003 when a group of German brewers, including Rainer and Joerg Pott of Pott’s Brauerei, took a tour of American breweries that included Harpoon. A few years later in 2007 Joerg joined the Harpoon staff for the summer months to learn more about American craft beer. During Joerg’s 3-month tenure at Harpoon, the idea of brewing a beer together was mentioned often, but the timing never quite seemed to work out— until now. Availability – 22oz Bombers. Draft. One time, small batch, 100 Barrel brew. On shelves now until sold. Taste Expectations – Hot summer days make for great session beer drinking. It’s a strongly carbonated amber lager, with bready caramel malts and a noble hop flavor. It’s light and crisp. Beer Street Journal has one of the largest online collections of original content dedicated to covering beer culture, education, and the advancement of the beer industry. With thousands of articles, millions of unique visitors, and exposure in over 200 countries, Beer Street Journal is paving the way to enabling category growth, engaging a broader consumer base, and promoting better tasting beer for years to come.